Nick's Flick Picks: The Blog: What's Wrong with 1949? For me, it's about Olivia. I loved her in this role-one of my favorites (outside of her late 1930's work). I think it was that haunted, brittle look on the stars, and the way she pulls off that passive lust for Clift (and the restraint there-most human beings would be throwing themselves on Clift in 1949). And though it's not eligible, you mentioned The Third Man, and that's just a cosmic rule to discuss that that film is completely, ridiculously wonderful. Near perfect. Could Orson Welles be more sensational as Harry Lime? As far as actressing, Alida Valli is excellent, though overshadowed by her costars. That last sequence still haunts. I love Olivia de Havilland, especially here in The Heiress. Her coldness and escalating bitterness was a nice change of pace for her. I find her transformation ingenious and one of the most daring of the 40's (well, after nearly anything Bette Davis did during the decade). Looking on my ballot, I'm quickly realizing how weak of a year it was. I can't even come up with 5 nominees! I have de Havilland, Judy Garland in In the Good Old Summertime (anything she did between St. Louis and Summer Stock was award worthy), Hayward (The film is pretty mediocre, but, as always, she's the best things about the film) and Katherine Hepburn (although you said she's ineligible for this year). I haven't seen Caught or The Reckless Moment (hell, I've never even heard of them me...bad me) and it's been awhile since The Barkley's of Broadway. I don't remember anything that special about Rogers' performance so I may have to check that one out again. I knew the Olivia fans would come calling quickly! @DJH: Ditto on the above. I love seeing de Havilland "get" coldness, since you're right that it was hardly her stock in trade, but I think she delivers it a bit too often and with too little complication to fully serve the story. As for Rogers, I expect/hope that someone on the poll slate will eventually unseat her: I like the performance very much, but in a better year, she'd never be my favorite, and probably none of my five current faves would even be on my ballot. That's why I'm so hopeful about what's still to come on my viewing list! Can't help you much except to join the others in praising Olivia. Her perf is hovering around the bottom end of my top 5 Best Actress winners, and although I'd agree that there are some scenes where she overdoes the "audience, are you following this? ", but she's so incredible in the ending that it makes me forget any faults--until you bring them up! I think 1949 was kind of a crappy year overall. My top ten films is solid but unspectacular (and includes some films that weren't eligible that year, so maybe it's not even solid), and I can't help you at all on surprise lead actresses. Your list of "further research" shows how weak the year was--you're actually contemplating Lizabeth Scott and Hedy Lamarr. Yuck. It must bore both of us to agree so often, but I'm with you on De Havilland Nick. What frustrates me about The Heiress -- which I think is a terrific piece of film-making -- is that she's the vaguest thing in it. 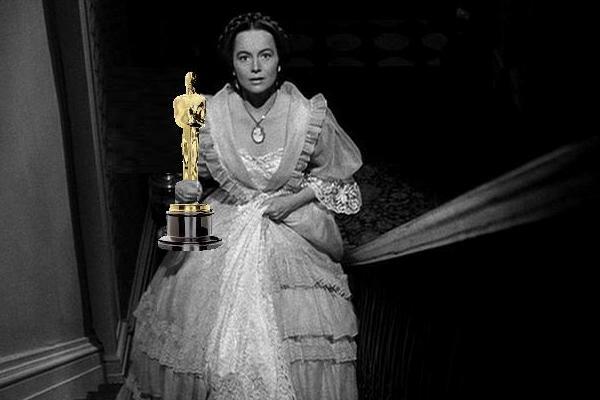 For me it's a case of a slightly disappointing performance being hoisted up to Oscar by the quality all around her. She's never less than adequate, but I don't think she gets Catherine, really, and I totally hear you about over-signalling the pathos. There's something one-note (or two-note, if you like) and a bit stifling about the perf that just bothers me. I've seen quite a few of the other films you mention, and agree that the Ophuls movies are probably the strongest picks without yielding exactly startling work. Virginia Mayo makes less of an impression in White Heat than Margaret Wycherly as Ma. Otherwise I'm stumped. Just one of those humdrum years I guess. You're hard on Livvy in "The Heiress," and I hate to say that I can see what you're saying. But only about the first half of her performance, especially when she's being "oblivious." The bitter second half is so strong and convincing that I don't mind that there are no shadings, per se. Or that she lingers over her lines, as if she's enjoying them. She is, and Catherine is, too. Of the actual nominees, it would be nice to give it to Hayward; I think "Foolish Heart" is the best of her nominated work. Nothing embarrassing, as there is in the later ones. Greer Garson is surprisingly good in "That Forsyte Woman." And Miriam Hopkins should have won as Best Supporting Actress for "The Heiress"--everyone hated her personally, which is why she wasn't nominated, most likely. Finally, I'm bewildered about your enthusiasm for Ginger Rogers in "Barkleys." I haven't seen it in years, and should probably look at it again. But I can still remember being so embarrassed for her during that incredible Sarah Bernhardt recital scene! What in God's name is she doing in that? I’ve been going through a 1949 marathon this year, and am currently about to wind down and move on to another year. (Any suggestions as to the year?) I’ve seen about 40 movies, and have about 10 or so left. I don’t much like Olivia de Havilland in The Heiress; I think that the transformation from hopeful and romantic to cold and bitter is not believable. And Ralph Richardson as the father is so one-note that his only motivation for anything is apparently to be mean and cruel. But then again, I think the movie itself is a big misfire, yet another humorless Henry James adaptation that seems to miss the fact that he was actually funny and quite witty. Jeanne Crain in Pinky is a confusing case; I think she’s badly miscast here, and I don’t think there’s anything she could’ve done that would’ve overcome that. Generally, I like her a lot though—I wouldn’t have objected to a nomination for A Letter to Three Wives, and I’ll even go one further and say that I think that Mankiewicz should’ve cast her rather than Anne Baxter—who doesn’t quite work because she seems calculating from frame one—in All About Eve. Pinky the movie doesn’t work for me because Kazan doesn’t seem to have any understanding of the social milieu; Gentleman’s Agreement, despite the PC social plot, works very well I think as a look at a social milieu from someone who understands it. Pinky just doesn’t have that compensation. As for the other three, I’ve only seen Hayward. I don’t much like her, but she’s serviceable in a movie that is languishing in a pretty well-deserved obscurity. (Is Marc Robson one of the only directors in the history of cinema who peaked with his first film?) Come to the Stable is on Netflix via Play Now, but I’ve never run across Edward My Son, which is my hope for redeeming the category. @Goatdog: One of your top five winners? Praise indeed. I just can't go there, but it's dispiriting to hear that you haven't seen much else from '49 that warrants greater enthusiasm. @Tim: You can't actually think it bores me. I agree with every word about The Heiress (which I had the pleasure of teaching for the first time this spring) and about de Havilland, who's somehow more frustrating for not being bad, just resolutely un-wonderful. @Dan: I agree that the second part of the performance feels sturdier than the first, but I do think it's easier to pick one mode and stick with it. Why is this Catherine so imperious and icy to her maid Maria? It's partly the play and screenplay's fault, but why can't de Havilland show us a Catherine who has soured on love / Morris / men without having turned into an all-purpose battle-axe? As for Rogers, I fully concede that a second trip to her performance may diminish my fondness for it, but I've always admired her savvy gifts for humanizing Astaire and warming up their movies, and at least in my semi-distant memory, she made Barkleys entertainingly silly but also emotionally credible, using all her own regrets and aspirations as an actress in service of this character. Two questions I can't resist: why did everyone hate Miriam Hopkins? And do you not like Hayward in I'll Cry Tomorrow? I'm a sucker for that one. @DWS: Where have you been all my life? These are great and in many cases unpredictable recommendations, which I'll happily take to heart. Interesting defense of Gentleman's Agreement, which Nathaniel & Goatdog & I will be revisiting in a few months. I'm also mighty intrigued to see so much good will accumulating around Ingrid Bergman in Under Capricorn. My jaw did drop a little over the idea of being a big fan of Betty Hutton. I am the exact opposite of this friend you describe. But, as they say, chacun &#224 son actrice. Livvy's Catherine is cold to her servant Maria because the girl has complimented her appearance, and Catherine finds any comment like that insincere. She's so damaged by her father that she cannot even accept a simple compliment. I guess we'll just have to agree to disagree, but I think she's indelible in those last scenes. "Bolt the door, Maria"..."He came back with the same lies...the same silly phrases..."
If I remember correctly, Catherine in the book is more of a blobby presence, and James mocks her for eating too much. I actually prefer the stage/film version...it's not one of his best stories, and Lord knows there's no humor in it. I love Ginger Rogers in everything she did up to 1943 and "Tender Comrade," where she's awful, suddenly. And she stays awful for the next 20 years of her movies. I have no idea why this happened. From Bette Davis on down, everybody had a score to settle with Miriam Hopkins and her scene-stealing, upstaging tricks. It ruined her career. She did send a nice telegram to Bette in 1949 that said, "I'd rather be second fiddle in a hit (The Heiress) than top-billed in a flop (Beyond the Forest)." She should have been nominated for so many films, but her personality off the screen alienated too many people. Finally, I love Susan Hayward in "I'll Cry Tomorrow" and "I Want to Live! ", but strictly in a guilty pleasure sense. Dave Kehr had a good piece about her in the Times when "Tomorrow" came out on DVD. I think Olivia De Havilland is masterful in "The Heiress," but if you're looking for competitors, you might want to look at Valerie Hobson in the British film "The Rocking Horse Winner." Arguably, she's stiff at times, but much less so than in most of her other work, and the stiffness fits the character. She gives a striking performance, but her work in the movie went unrecognized. @Matt: I've heard great things about Hobson in this film, but alas, it premiered in the U.S. in 1950... so she's back in the already-heady mix with the other banner performances of that year. Maybe when I finish this essay I'm working on, I'll tackle that year next, to make up for the last two, mostly unsatisfying races I've covered. BETTE DAVIS "Beyond the Forest"
If Bergman and Hobson are ruled out because of late U.S.release dates, then I'd substitute Ann Sothern and Linda Darnell, both for "Letter to Three Wives"
DORIS DAY "My Dream is Yours"
DEBORAH KERR "Edward My Son"
ALIDA VALLI "The Third Man"
Jeanne Crain in "Pinky".Call me crazy but, personally, I think she transcended the perceived miscasting. As for Ginger Rogers in "The Barkleys of Broadway" - well, you and I will never EVER be on the same page there. I'd say that Sarah Bernhardt scene alone demands some sort of retroactive mega-Razzie award. It ain't pretty. @Ken: There you are! I think about you a lot when I write posts like this, since you've always got great recommendations. Peggy Cummins is another '50 qualifier, because of the weird way Gun Crazy was released. But your long, generous list is wonderful, and leaving aside my own silly stipulations for this exercise, I've long been eager to see Stromboli and some of these others. Lastly, since it's looking like I'll really have no takers on my Rogers endorsement... again, in a stronger year, she wouldn't be my gal, but every performance in this field has (for me) some conspicuous shortcomings. Rogers's matter less to me than the others' do, and her virtues are considerable. The big, climactic Sarah Bernhardt scene is a little crazy, and her versions of Broad Acting in the previous rehearsals are very broad indeed. But, even then, and certainly by “La Marseillaise,” she's obviously sending up the whole shebang, right? – I mean, both the contrivance of the Barkleys script and Bernhardt's own legacy of extreme stylization. After all, this happens well into the home-stretch of Barkleys, when the film explicitly okays staginess and song 'n' dance as perfectly reputable alternatives to high drama. Maybe not a brilliant scene, but I think she's funny in it, and charismatic, and I like that her take on what she’s doing in this sequence is a little hard to read. WAY more crucial to me in any case is the sad, fantastic scene in which she balks at reuniting with Astaire even after Oscar Levant has hoodwinked then into dancing together one last time ("They Can't Take that Away from Me"), which is even more poignant than the very good acting she does during that dance. And she's touching as well as quite funny during the conclusion scene: she makes quick, pert gestures around Fred’s empty apartment when a slower gesture would certainly be maudlin, but she doesn't hustle through the sequence, either, so it still has time to reverberate. It might sound like I’m ascribing all of the poignancy to who Rogers *is*, and our extra-filmic associations with Fred and Ginger, but I actually think she *manages* those associations brilliantly (not relying on them too heavily, but not lazily leaning on them), and her comic timing is still great (“just a little torture”). It's an unconventional film, especially compared to the other Astaire and Rogers films, but I really think she makes it work. Darn you, Nick, for being such a persuasive rascal. Can I really be thinking of watching BARKLEYS again? Guilty. And I've enjoyed hating Rogers' performance for so many years now. Still, maybe in spite of your eloquent appraisal, I'll still be able to muster up a little bit of a hiss. If not,well. who knows, I may start doubting my own long-held opinions on telemarketers, on people who describe anything and everything as "awesome" and on Mary Pickford's performance in COQUETTE. @Ken: I don't expect to transcend "agreeing to disagree" about this performance, but if you do watch it again, I hope it improves for you, at least a little. If it's any consolation, you won't get any arguments from me on those other three scores you mention. I just re-screened The Barkleys of Broadway based on your recommendation and I must say that Ginger Rogers pleasantly surprised me and is- dare I say it- Oscar-worthy (although Olivia still should have won). It seems as if she's taking the best things about her previous Oscar-worthy work (the dancing and personality from Top Hat and the comedic chops from Stage Door) and has finally found a vehicle that ably combines them. The film itself is solid, if a bit clumsy at times, but Rogers proves herself in ways we hadn't seen before.